Definition at line 41 of file llfloateravatartextures.h. Definition at line 42 of file llfloateravatartextures.cpp. Definition at line 48 of file llfloateravatartextures.cpp. Definition at line 98 of file llfloateravatartextures.cpp. Definition at line 195 of file llfloateravatartextures.cpp. References find_avatar(), LLPrimitive::getNumTEs(), LLPrimitive::getTE(), i, llendl, llinfos, and S32. Definition at line 68 of file llfloateravatartextures.cpp. 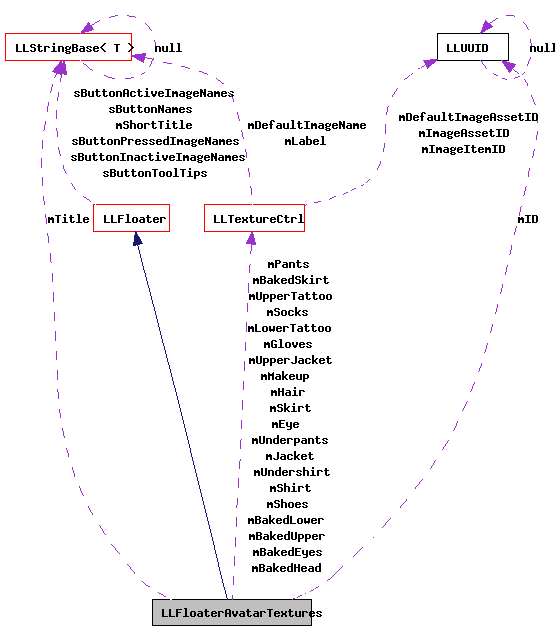 References LLPanel::childSetAction(), LLPanel::getChildByName(), LLFloater::getTitle(), mBakedEyes, mBakedHead, mBakedLower, mBakedSkirt, mBakedUpper, mEye, mGloves, mHair, mJacket, mLowerTattoo, mMakeup, mPants, mShirt, mShoes, mSkirt, mSocks, mTitle, mUnderpants, mUndershirt, mUpperJacket, mUpperTattoo, onClickDump(), refresh(), and TRUE. Definition at line 140 of file llfloateravatartextures.cpp. References LLUUID::asString(), DB_FIRST_NAME_BUF_SIZE, DB_LAST_NAME_BUF_SIZE, find_avatar(), gCacheName, LLVOAvatar::getID(), LLCacheName::getName(), mBakedEyes, mBakedHead, mBakedLower, mBakedSkirt, mBakedUpper, mEye, mGloves, mHair, mID, mJacket, mLowerTattoo, mMakeup, mPants, mShirt, mShoes, mSkirt, mSocks, mTitle, mUnderpants, mUndershirt, mUpperJacket, mUpperTattoo, LLFloater::setTitle(), LLVOAvatar::TEX_EYES_BAKED, LLVOAvatar::TEX_EYES_IRIS, LLVOAvatar::TEX_HAIR, LLVOAvatar::TEX_HEAD_BAKED, LLVOAvatar::TEX_HEAD_BODYPAINT, LLVOAvatar::TEX_LOWER_BAKED, LLVOAvatar::TEX_LOWER_BODYPAINT, LLVOAvatar::TEX_LOWER_JACKET, LLVOAvatar::TEX_LOWER_PANTS, LLVOAvatar::TEX_LOWER_SHOES, LLVOAvatar::TEX_LOWER_SOCKS, LLVOAvatar::TEX_LOWER_UNDERPANTS, LLVOAvatar::TEX_SKIRT, LLVOAvatar::TEX_SKIRT_BAKED, LLVOAvatar::TEX_UPPER_BAKED, LLVOAvatar::TEX_UPPER_BODYPAINT, LLVOAvatar::TEX_UPPER_GLOVES, LLVOAvatar::TEX_UPPER_JACKET, LLVOAvatar::TEX_UPPER_SHIRT, LLVOAvatar::TEX_UPPER_UNDERSHIRT, and update_texture_ctrl(). Referenced by draw(), and postBuild(). Definition at line 52 of file llfloateravatartextures.cpp. References LLView::addChild(), LLFloaterView::adjustToFitScreen(), LLUICtrlFactory::buildFloater(), FALSE, gFloaterView, gUICtrlFactory, LLFloaterAvatarTextures(), and LLFloater::open(). 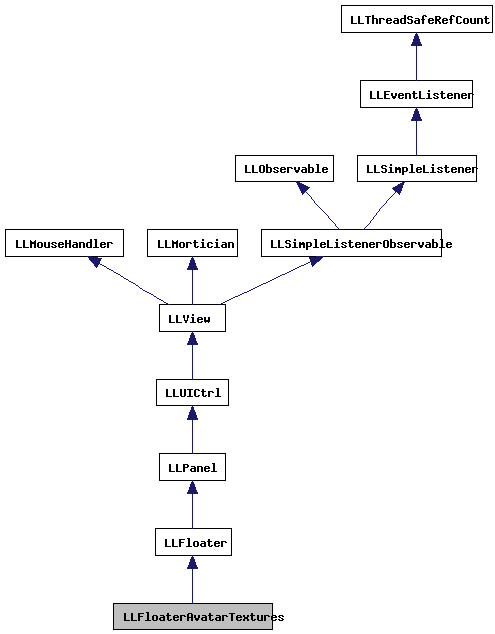 Referenced by handle_debug_avatar_textures(), and LLAvatarDebug::handleEvent(). Definition at line 61 of file llfloateravatartextures.h. Referenced by postBuild(), and refresh(). Definition at line 60 of file llfloateravatartextures.h. Definition at line 63 of file llfloateravatartextures.h. Definition at line 64 of file llfloateravatartextures.h. Definition at line 62 of file llfloateravatartextures.h. Definition at line 67 of file llfloateravatartextures.h. Definition at line 71 of file llfloateravatartextures.h. Definition at line 65 of file llfloateravatartextures.h. Definition at line 58 of file llfloateravatartextures.h. Definition at line 77 of file llfloateravatartextures.h. Definition at line 74 of file llfloateravatartextures.h. Definition at line 66 of file llfloateravatartextures.h. Definition at line 73 of file llfloateravatartextures.h. Definition at line 68 of file llfloateravatartextures.h. Definition at line 75 of file llfloateravatartextures.h. Definition at line 79 of file llfloateravatartextures.h. Definition at line 76 of file llfloateravatartextures.h. Definition at line 59 of file llfloateravatartextures.h. Definition at line 78 of file llfloateravatartextures.h. Definition at line 72 of file llfloateravatartextures.h. Definition at line 70 of file llfloateravatartextures.h. Definition at line 69 of file llfloateravatartextures.h.